On the first day this year that the bees were flying freely, I decided that it was time to do a varroa mite test. Two (centrally placed) colonies in an apiary of four had varroa screens and suddenly, after Christmas, the varroa drop on those trays looked ominously high. I didn’t expect to see any varroa but over a period of two weeks the weekly fall was in tens! The reason for this unprecedented early season high drop rate is mysterious. The colonies appeared healthy and showed very little sign of varroa all last season. When treated with Apiguard in late summer, the varroa drop was surprisingly small. My best guess is that there was a late season invasion from bees fleeing one or more varroa-infested feral colonies in the area. Another apiary two miles away and treated in exactly the same way shows no such alarming signs of varroa. Action was clearly needed. Three weeks ago, one colony was treated with Apistan, the other (a stroppy bunch that were due for uniting with a nicer colony later in the spring) was left untreated for the time being. The test for the presence of the mite with Sweinty’s varroa tester is simple. 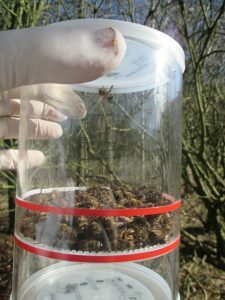 Approximately 200 bees are collected in a special container (see photo). Using a CO2 ‘gun’, the container is filled with CO2 gas which stuns but does not kill the bees. It also seems to stun the varroa mites. 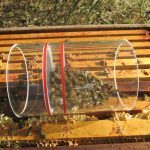 While the bees are comatose, the container is shaken moderately and varroa clinging to the bees should fall through a metal mesh to be collected and counted in the bottom lid. 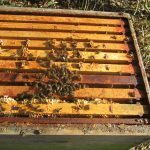 When the bees are exposed to fresh air again, they revive and can be left on top of the frames to make their way back down into their hive again (see photos). Today, the CO2 varroa tester results were illuminating. 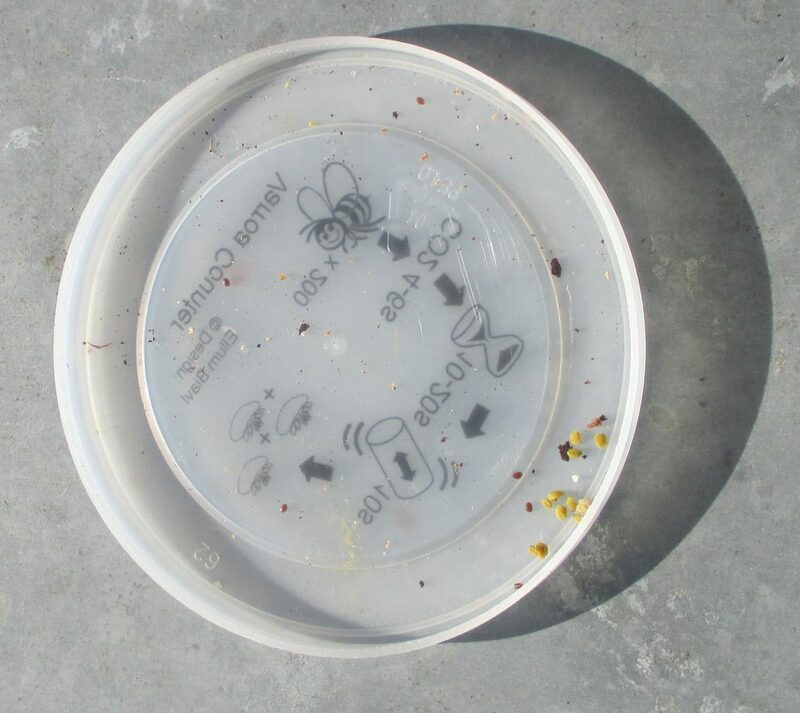 The two colonies without varroa trays showed one varroa mite each. I have seen no figures of what is acceptable but this was not alarming. The colony recently treated with Apistan showed one varroa mite, indicating that the treatment had been working well. The untreated colony showed a drop of five varroa mites! The untreated colony result was rather alarming — but expected. According to the suppliers of the tester, a drop of more than 15 mites in summer would indicate that the bees should be treated immediately. In a winter-sized colony in February just as breeding of both bees and varroa has begun, the figure seems alarmingly high. Apistan was immediately inserted in this colony. In the USA, a widely accepted metric is that a drop of three or more varroa mites from 100 bees in an alcohol wash indicates that a colony is doomed. With my bees, that drop of five mites from about 200 bees suggests that the colony is teetering on the brink. This apiary will be under very special observation this season.